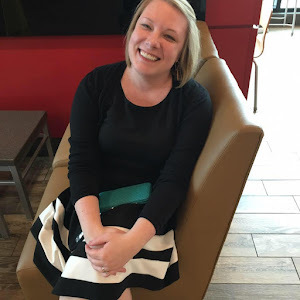 You may have noticed, Reader Friends, that I seem to be in a bit of a blogging slump right now. I'm reading plenty, I just can't seem to motivate myself to post as much. In an attempt to get things jump started, I'm going to go back to using Goodreads summaries instead of trying to come up with my own. 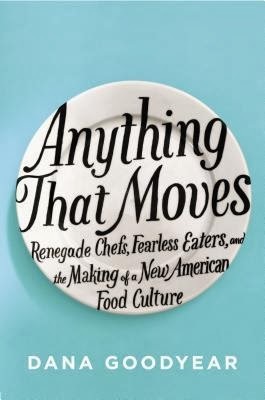 Dana Goodyear’s anticipated debut, Anything That Moves, is simultaneously a humorous adventure, a behind-the-scenes look at, and an attempt to understand the implications of the way we eat. This is a universe populated by insect-eaters and blood drinkers, avant-garde chefs who make food out of roadside leaves and wood, and others who serve endangered species and Schedule I drugs—a cast of characters, in other words, who flirt with danger, taboo, and disgust in pursuit of the sublime. Perfection. Goodyear is a staff writer for the New Yorker, and has published a few collections of poetry, but this is her debut work of non-fiction. Despite it being her first book, you can tell that she has quite a bit of experience as a journalist. I also loved how willing she was to get into the spirit of her book - she didn't just report on the world of adventurous eating, she participated (where she could - during parts of the book she was pregnant and unable to eat some of the unregulated or unsafe items she describes). Again, I loved it. I thought it was the perfect mixture of humor, research, and anecdotes from Goodyear's tour of unusual cuisine. I'm not typically a reader of food books (I have some Bourdain but haven't read him yet), but I do enjoy the occasional episode of Andrew Zimern's Bizarre Foods. This reminded me a lot of that show, although the focus here is on food in America. I'm not in the least squeamish, but I can imagine that some of these food descriptions may bother those with more delicate stomachs. I really enjoyed this book and the author's style and sense of humor. She reminded me of a Mary Roach for the foodie world. I'll be watching for her next book. If you are a foodie, if you like the idea of crazy foods, or if you're a fan of Mary Roach, this is a great choice for you. I think I'm going to have to give this one a try. Don't worry about using the Goodreads summaries...that's normally what I use!